How much do we love coconut? I mean seriously, I can't get enough of the stuff! I have it as light coconut milk AND full fat cream in cans in my pantry, a giant tub of unrefined oil for cooking and as a lotion in my cabinet, and as flakes in my freezer. It only made sense that it would slowly make its way into every aspect of our lives. Like this side dish for example; we always eat dried beans, rehydrated low and slow in a pot of simmering seasoned water anyway. 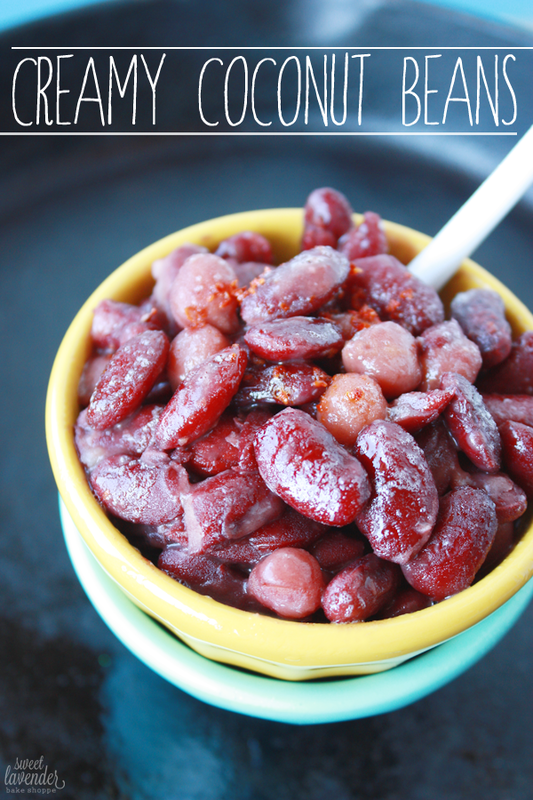 Beans are such a great source of vitamins and fiber! Why not kick it up 300 notches and add in a can of coconut milk? What exactly would happen if we did? Creaminess is what. Incredible coconut creaminess with a tropical taste and feel, made out of unprocessed ingredients and love. It's like we've been taken straight to some beach in Jamaica, sunning and loving life. Via beans. Or something. 1. Into a large sauce pot, add your beans, milk, water, chile flakes and garlic cloves. Stir, cover and bring to a boil. Once boiling, stir again, cover and turn heat down so that you have a steady and gentle simmer. 2. Simmer, stirring occasionally until beans are just cooked through, about 1 1/2 hours. Watch the bottom of your pot for scorching and also watch the liquid level. As beans cook through, the liquid will diminish. If your liquid has evaporated before beans are done, add a little more water, turn heat down, and continue cooking until beans are just tender. 3. Next, remove lid, add salt, and cook uncovered over low, until beans are fully cooked and the coconut milk mixture is extremely thick and creamy. This should take another 15-20 minutes. Stir every so often and gently. We're not looking to break up the beans. Also, now is the time to really watch the bottom of your pot. Make sure nothing burns at the bottom! Stir as often as needed to keep this from happening. 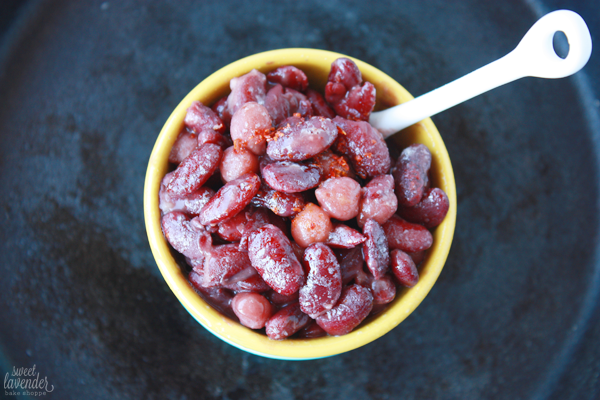 **Beans can be cooked up to 2 days ahead and stored in the fridge in an air tight container. To reheat, simply add a tiny bit of water into the bottom of a non-stick skillet, add your beans and coconut cream sauce, and reheat over medium-low, stirring occasionally until warmed through. Recipe slightly adapted from Poulet by Cree LeFavour. Beans cooked low and slow in a bath of seasoned coconut milk is where it's at, folks. Trust me. Linking up this blog post with Chantel and Beth's blogs! can I tell you something so sad? I am actually allergic to coconut. can you even believe how unfair my life is? haha! These look amazing. and I'll be eating them in my dreams. So much YUM! I LOVE beans and coconut...but you have given just the push I needed to combine them! :) I am going to try this next week, and I will let you know how it turns out! Thanks for such an awesome recipe! Yes, yes, yes, yes. Oh my goodness, yes. I cannot wait to try these! Coconut?...In it's normal form, not for me (texture thing, I know, sad). Coconut milk? Yes! And beans, yes! This sounds so yummy. But what would you serve it with? We served this alongside roasted corn on the cob and grilled chicken! Haha, yay! So happy to hear all the enthusiasm! SO hope you do make it! Oh awesome! Please do let me know how it went! Gosh, good question. I'm such a lame-o when it comes to the crockpot. If you figure it out, please let me know!